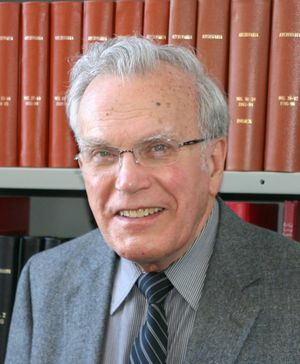 Helmut Theodore Huebert: surgeon, church layman, and amateur historian: born on 23 February 1935 to Gerhard D. (18 April 1906, Margenau, Molotschna Mennonite Settlement, South Russia - 12 May 1981, Winnipeg, Manitoba, Canada) and Katharina (Katie) (Willms) Huebert (12 September 1909, Hierschau, Molotschna Mennonite Settlement, South Russia – 29 April 2001, Winnipeg, Manitoba, Canada) in Bassano, Alberta, Canada. On 21 December 1957, he married Dorothy Rempel, daughter of Peter (2 June 1901, Tiegenhof Estate, Alexandrovsk, South Russia – 21 February 1976, Winnipeg, Manitoba, Canada) and Katherine (Katie) (Barkmann) Rempel (22 November 1901, Ladekopp, Molotschna Mennonite Settlement, South Russia – 18 November 1997, Winnipeg, Manitoba, Canada), at the South End Mennonite Brethren Church in Winnipeg. He worked as a doctor, did considerable research into Mennonite history, and helped extensively in the church. He died of a massive stroke in Winnipeg on 21 November 2016. Helmut was born in Bassano, Alberta, Canada to immigrant parents and grew up in nearby Gem. He was the eldest of three brothers in the family. His father was a minister and Bible college instructor whose work and studies took the family to many different parts of Canada and the United States. Finally, the family moved to Winnipeg, Manitoba, Canada, where Helmut completed his high school education at the Mennonite Brethren Collegiate Institute. Following his high school graduation, Helmut began classes at United College (the University of Winnipeg). After finishing his undergraduate studies, he went on to medical school and chose to specialize in orthopedics. In 1957 Helmut married Dorothy Rempel in Winnipeg. Their first daughter, Karen, was born in 1960. Further studies took Huebert and his small family to Oswestry, England, for a year. Later, when son David (born 1964) was still very young, the family spent some time in California before returning to Winnipeg. The last member of the family, Susan, was born there in 1967. Medical work took Helmut and sometimes his family to many parts of the world, including Zaire (now Democratic Republic of Congo), Bangladesh, and Paraguay. Travel for historical interest and relaxation also took the family to the Rocky Mountains in western Canada, various parts of Europe, China, and other parts of the world. Meanwhile, Helmut also pursued a long-term interest in researching various aspects of Mennonite history. He eventually published ten books, including the Mennonite Historical Atlas, which he wrote together with mapmaker William Schroeder, as well as biographical works and other books on Mennonite subjects. Participation in church was always very important to Huebert. He was active in the Portage Avenue Church (Mennonite Brethren), where he served as moderator for several years, in addition to working on various committees. He sang on the worship team and in choirs, taught Sunday School, and sang in special performances with the Mennonite Festival Chorus on several occasions. In June 2005, Helmut retired from active work, although he continued as a consultant until the day of his death. In 2012, he experienced a heart attack while visiting the family cottage, and he began to have a series of increasingly frequent health episodes. On 21 November 2016, after a morning at work, he suffered a severe stroke and died that afternoon. The memorial service was at the Portage Avenue Church on 25 November. Helmut Theodore Huebert was a dedicated doctor, amateur historian, and church worker who was well known for his contributions in these and other areas. Through his commitment to his work and other interests, he was an example for others to follow. GRANDMA (The Genealogical Registry and Database of Mennonite Ancestry) Database, 4.19 ed. Fresno, CA: California Mennonite Historical Society, 2005: 223768. Huebert, Helmut. "My Story: Helmut Theodore Huebert." Unpublished manuscript. 1 June 2014. Huebert, Helmut. The Life of Katharina Johanna Huebert: By the Grace of God from the Cradle to the Grave. Winnipeg: Helmut Huebert, 2003. Obituary. Winnipeg Free Press. http://passages.winnipegfreepress.com/passage-details/id-240836/HUEBERT_%20HELMUT. Web. 10 January 2016. Obituary. Katherine Rempel. Mennonite Brethren Herald. (6 February 1998): 28. The Braun-Willms Family of Hierschau. Winnipeg, MB: Helmut T. Huebert, 2011. Crimea: the Story of Crimea and the Mennonites Who Lived There. Winnipeg, MB: Springfield Publishers, 2013. The David Hueberts of Margenau. [Winnipeg, MB]: Helmut Huebert, 2009. Events and People: Events in Russian Mennonite History and the People that Made Them Happen. Winnipeg, MB: Springfield Publishers, 1999. Katharina Johanna Huebert: By the Grace of God from the Cradle to the Grave. Winnipeg, MB: Helmut Huebert, 2003. Kornelius Martens: Our Skillful Advocate: a Brief Biography and Collection of the Poetry and Other Writings of Kornelius Kornelius Martens. Winnipeg, MB: Springfield Publishers, 1986. Mennonite Estates in Imperial Russia. Winnipeg, MB: Springfield Publishers, 2005, 2008. Mennonite Historical Atlas (with William Schroeder). Winnipeg, MB: Springfield Publishers, 1990, 1996. Mennonite Medicine in Russia: 1800-1930. Winnipeg, MB: Springfield Publishers, 2012. Mennonites in the Cities of Imperial Russia, V. 1 and 2. Winnipeg, MB: Springfield Publishers, 2006-2008. Molotschna Historical Atlas. Winnipeg, MB: Springfield Publishers, 2003. Rempel/Huebert Origins: Our Family Heritage (with Dorothy Huebert). [Winnipeg, MB: Dorothy Huebert, 2010]. Huebert, Susan. "Huebert, Helmut T. (1935-2016)." Global Anabaptist Mennonite Encyclopedia Online. January 2017. Web. 20 Apr 2019. http://gameo.org/index.php?title=Huebert,_Helmut_T._(1935-2016)&oldid=163702. Huebert, Susan. (January 2017). Huebert, Helmut T. (1935-2016). Global Anabaptist Mennonite Encyclopedia Online. Retrieved 20 April 2019, from http://gameo.org/index.php?title=Huebert,_Helmut_T._(1935-2016)&oldid=163702. This page was last modified on 26 March 2019, at 21:49.